The Dell PowerEdge M710 server has a myriad of memory upgrade options available. 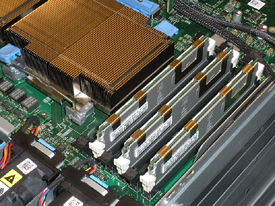 The system supports up to 288GB of RAM using DDR3 registered RDIMMs or 24GB when using unbuffered ECC UDIMMs. Single and dual-rank DIMMs can be 1067 MHz or 1333 MHz and quad-rank (4R) DIMMs can be 1067 MHz. RDIMMS and UDIMMS cannot be combined in the same server. The system contains nine (9) memory sockets for each processor for a total of eighteen (18) sockets. Each nine-socket set is organized into three channels of three memory sockets per channel. The first socket of each channel is marked with white release levers. For assistance with memory installation and population rules, please see the Dell PowerEdge M710 Hardware Owner's Manual. You can also email or call us at 1-800-416-8900. Unless otherwise noted, memory DIMMS are tested, pulled from working servers and backed by our 90-day parts replacement warranty.